Perhaps a Bloody Mary would have done the trick but, feeling a little shabby after another big day, I settled for a cup of tea instead as we settled into the executive lounge at Gatwick Airport. It is a crime really, with all that free drink available to tired and thirsty executives like myself, but there you have it. Nothing changed on the plane, although by this time I had recovered a little, but I stuck with the tea. The reason is that after a very pleasing few days in England, watching the ritual slaughter by the home country of the Australian cricket team , we must return to Valbonne in order to repair for the arrival of two old friends, the lovely Lizzy and considerably older and slightly crusty Charley Bailey, tomorrow for a few days. How on earth this charming and accommodating chap (who is so intelligent that it seems his brain has expanded so much it has killed the hair follicles on his scalp, rendering his almost bald) managed to snare the most beautiful maiden in Norfolk, has long since had me mystified. For many years I have asked him what he does for a living but the explanation is so long-winded and vague that I doze off during the monologue and have come to the firm conclusion that he must be a spy. The number plate in his car ends in 007 so that seems I confirm my suspicions. Whilst I have been away, a couple of rather unsavoury public schoolboy chappies came to my house in France to steal from me, and threaten me with one of their pranks. 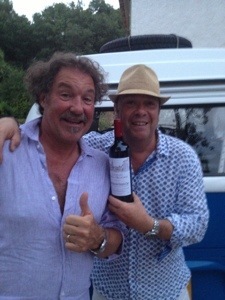 I have evidence of this in the form of a photograph they sent me, which is my photo today, and the note which accompanied it, and I quote “We were feeling a bit poor so I thought I would nick some of your wine … when you are back Paul and I will be buggering you senseless …”. Mr Clipboard in the right, and Paul “Slash and Burn” Thornton Allan were once again entertaining themselves at my expense, but with modern technology I have the evidence I need with which to approach the gendarmerie and have them both arrested, something I shall contemplate if my wine store bas been denuded in any way. Before laying those charges, I shall give them an opportunity to repair the situation, which at the very least should see the cellar expanded a little in recompense (perhaps a case of a decent Bordeaux should do it). If not then I shall have to consider how best to use this evidence. Today, before the spy and his gorgeous wife arrive, I will have to go to the driving range and hit some golf balls. Not having played golf in over a year, I will doubtless be playing whilst Charlie the spy is here so practice is required. A year spent in a drizzly and cold Britain had crushed from me any desire to play but with sunshine over just about all of Europe, I feel those golf like stirrings in my loins. Before their arrival we must make good the destruction wrought by the Sprogs who have been “in charge” of the house, helped by a coterie of friends, for the past few days. That Nice Lady Decorator has read them the riot act in a most commanding way and they have scampered off to friends houses to avoid serious retribution. However, they need money so they will have to come back some time to face the music. Then tonight more fireworks in Cannes, courtesy of Master Mariner Mundane aboard L’Exocet. Life is tough.